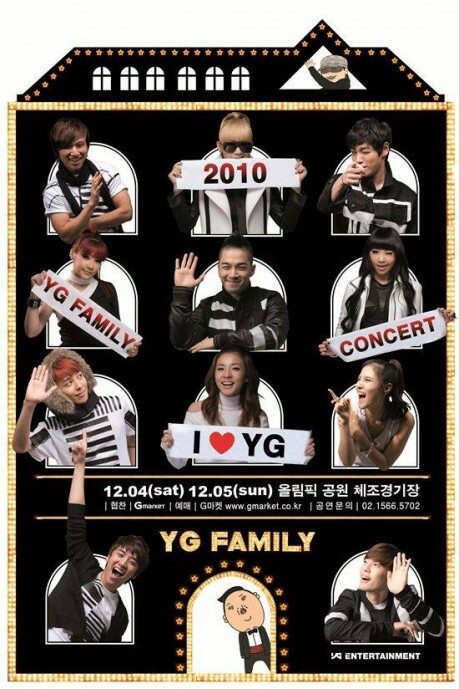 The YG Family has held their “ONE CONCERT” every year since 2003, however fans were left highly disappointed when the concert wasn’t held back in 2008 and in 2009. Being the first concert in three years, YGE will be bringing together their hottest stars – 2NE1, Gummy, Se7en, and Big Bang. PSY will also be joining them on stage as the newest family member. The two-day concert will seat a 36,000 member audience, and tickets start selling on October 21st at 8:00PM through Gmarket. If you’re a YG fan and you’re in the area, be sure to grab your tickets. It’s definitely looking to be one of the most exciting concerts of the year! This entry was posted on October 15, 2010 by redtofu. It was filed under Concert/Show, News and was tagged with 2NE1, big bang, YG Entertainment.